Windows generates and stores thumbnail preview images for all photos, images, pictures, video clips, movies, some documents and other multimedia contents in a cache database so that Windows Explorer (in Windows XP, Windows Vista and Windows 7) or File Explorer (in Windows 8, Windows 8.1 and Windows 10) can redisplay the thumbnail images quickly whenever a folder is reopened in view that shows the preview. This tutorial details the step-by-step guide on how to reset, clear, remove and delete the Windows thumbnails cache so that Windows will recalculate and regenerate the thumbnail previews again when you open a folder in thumbnail view or other views that display preview thumbnails. Deleting existing thumbnail cache is necessary if it’s corrupted such as not displaying thumbnail properly. in Windows XP, the hidden Thumbs.db files are stored in each directory that contains thumbnails. However, since Windows Vista, Thumbs.db no longer in use. Instead, Windows stores thumbnail in a centralized hidden location, namely %LocalAppData%\Microsoft\Windows\Explorer, as a number of files with the label thumbcache_xxx.db (numbered by size of thumbnail) as well as an index used to find thumbnails in each sized database. 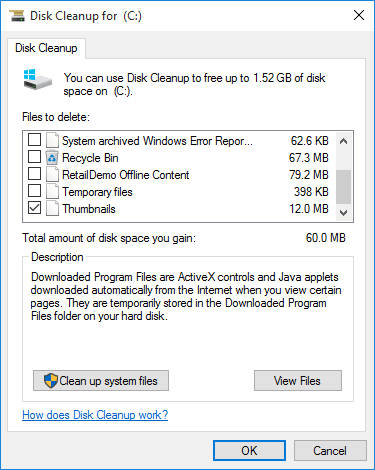 Run Disk Cleanup by searching for Disk Cleanup or CleanMgr.exe. 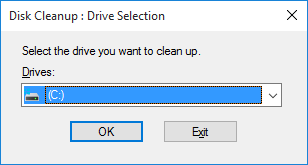 Select the drive that you want to clean up from the drop down list. The drive should be the one that Windows.old folder is located, which is almost always been the system drive of C:\. Hit OK to continue. Check (tick) the Thumbnails check box, then click or tap on OK.
Click or tap on Delete Files button when prompted with warning on whether are you sure want to permanently delete these files. Once the cleanup is completed, Disk Cleanup will close itself.